I know that your child is growing and you need to get rid of old baby items to make room for the new toddler things that they will need. If you are planning on having another child, I highly suggest storing the larger items like the crib, stroller, bouncer, bathtub, etc. to be used later. If you are done having children or you just need some extra space for now, I put together a list of the best way to get rid of each baby item so that you can get a little bit of money back in your pocket and keep as much out of the landfill as possible. I love being able to get some money back on baby items because a lot of things don’t even get used very often, they are practically brand new. Use this as a guide for items that can be sold to consignment stores, in Facebook groups, Craigslist, or at a yard sale. Make sure that items like cribs and strollers meet current safety standards. 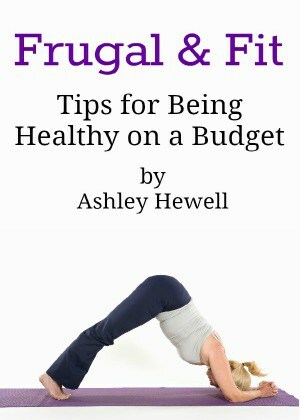 You can also hang on to strollers or car seats and save them for a trade in event. Babies R’ Us and Target usually have a trade in event every year where you can exchange your old items in for a discount on new ones. If you don’t want to deal with selling them, you can donate them to a charity. I like donating to local women’s shelters because they are always in need of baby and children’s items. books can be sold or donated to libraries, schools, and churches. It’s great to recycle as much as possible but make sure that your town or recycling provider can accommodate certain items like hard plastics. I will put an asterisk by the items that you might want to check with your recycling center about before you put them in the bin. Some areas are better equipped for those items than others. food pouches: collect and send them in to TerraCycle with a free downloadable label on their site. Most cities won’t recycle the pouches or their caps. Medela breast pump: Send the motor and cord back to the Medela Recycles program. car seats: You can pay for shipping to send it in to babyearth.com/renew and the usable parts will be recycled for developing countries to use in construction projects. Some items just can’t be sold, donated, or recycled. Here are some things you might just want to throw away. car seat: all have an expiration date so if you can’t pay to have it recycled, just throw it away. I always encourage people to sell or donate as much as they can. Local children consignment stores and Facebook groups are a great place to start selling your items. 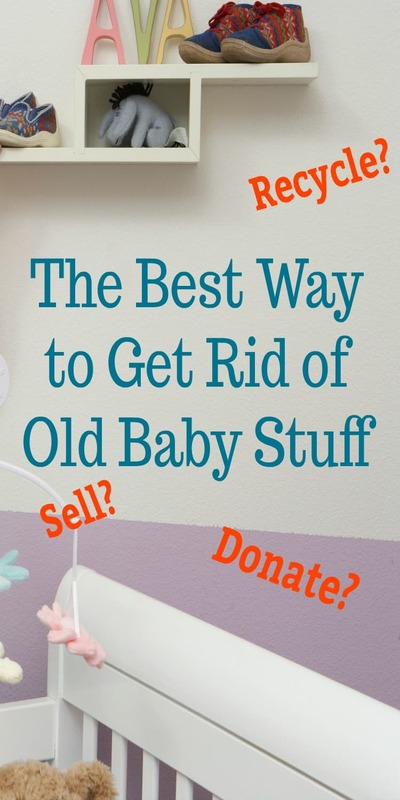 What do you think is the best way to get rid of old baby stuff? 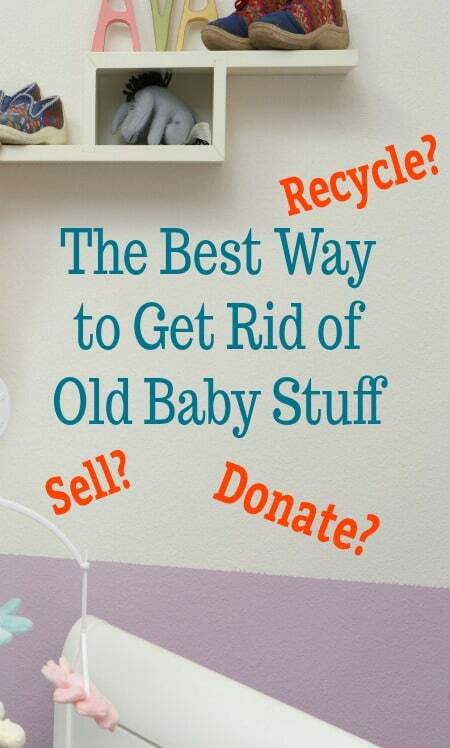 Do you give it to friends that are expecting, have a yard sale, or just take everything to Goodwill?